Teaching patients to fish is better than just giving them a fish–meaning an active therapy is better than a passive therapy. The goal is to change the public’s chronic sitting pattern; we need to get them to participate daily in their own healing. Much of our working world spends the majority of their time sitting. We all sit too much. It is common for people with back issues or sciatica to complain of an increase in low back symptoms with sitting. Many published journal articles have shown that sitting, especially prolonged sitting is generally accepted as a risk factor in developing low back pain. So what are we supposed to do? As most of you know I suggest moving to a stand up work station, but “Chair Care”-coined by Dr. Fryer is a simple maneuver one can do that may help. A recent study published in: The Spine Journal April 2010 looks at MRI changes in discs in relationship to sitting. It is a fascinating study. The investigators looked at MRI scans at several points in time and looked for changes in the intervertebral disc in relationship to sitting behavior. Loss of height in the discs was apparent after sitting for only 15 minutes. WOW! Imagine what happens after sitting all day! 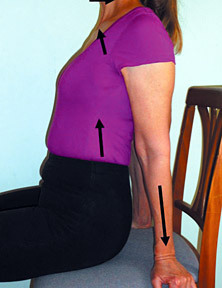 The “Chair care” or “unloading exercise” takes about 10 seconds to perform. With that small intervention, most of the lost disc height was recaptured. WOW! With that information in hand, doing this spine un-loading maneuver is a “no-brainer”. Unload the back every so often to help “plump up” and re-hydrate those discs. What is the significance of sitting and unloading studies? Research shows sitting for just 15 minutes produces significant compression of the spine and loads the discs in an unhealthy way. We can also tell and show the public/patients that these unhealthy changes can be decompressed rapidly using a seated unloading exercise.